8.B. Address the special needs of the LDCs. Includes tariff- and quota-free access for LDC exports, etc. No numerical targets were set No numerical targets were set. Target 8.A. : Negotiations of the multilateral trade round that delivers real and substantial benefits to developing countries are at an impasse. Target 8.C. : Although the special needs of LLDCs and SIDS have not been addressed explicitly in the Doha Round negotiations, special provisions for "small, vulnerable economies" in the agricultural, non-agricultural, rules and trade facilitation negotiations have done so indirectly. Indicator 8.6: About 84% of products from LDCs were imported duty-free quota-free (DFQF) to developed countries, in 2014. Indicator 8.7: Tariffs on developing country exports of agricultural products and textiles and clothing were 10.8 %, 7.3 % and 9.2% in 2000, respectively. With the exception of tariffs on agricultural products, tariff reductions since 2004 have been very small. Indicator 8.8: Agricultural support in OECD countries, as percentage of GDP, fell in 2013 to 0.7% of GDP in 2014, following a small rise in 2008, continuing the downward trend set in since the 1990s. But in absolute terms, it remains high, reaching $333 billion in 2014 and distorting trade. Indicator 8.9: Aid for Trade commitments, as percentage of sector allocable aid of OECD DAC donors was 55.4% in 2013. 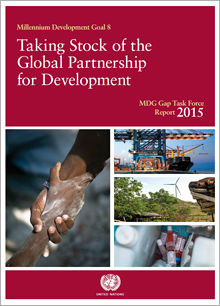 Aid for Trade flows reached a record high of $55.4 billion in 2013. Target 8.A. : Doha Round of trade negotiations that would deliver real and substantial benefits to developing countries in all areas of market access under MDG8 is still to be concluded. No numerical targets were set for the indicators, thus it is difficult to measure a gap. Target 8.A. : See Doha Development Agenda for more information. Indicator 8.6.: See WTO Hong Kong DFQF Target for specific target for duty-free market access for LDC products. Indicator 8.8.: See WTO Hong Kong Ministerial Conference commitment to eliminate agricultural export subsidies. Indicator 8.9.: See Aid for Trade Initiative for more information.